I want to invite you to explore the opportunity to attend an event in El Salvador where most all of your expenses are paid including shipping your car! 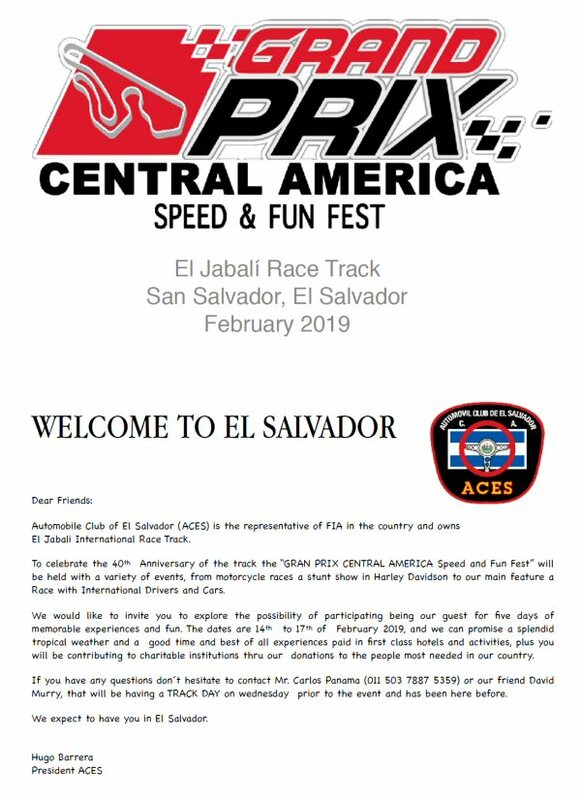 Feb 14-17, 2019 Carlos Panama, President of ACES (Automobile Club of El Salvador- FIA) and owner of El Jabali racetrack are hosting a "Speed & Fun Fest". It is an air show and race event. I will be there for the week helping with their track days through the race. They are looking for a few cars of different makes such as Porsche, Ferrari, Corvette, Lola T-70, BMW, Lamborghini, Nissan, Mazda prototype, etc. There are limited spots for each. They have a number of things planned from the air show and racetrack activities to fun countryside functions for you and your family. The event is for charity to help people in need in their country. I have been to the track several times and really like it. It's challenging and a track you must respect. See the short flyer below and click on it for more details. Let me know if you need anything.